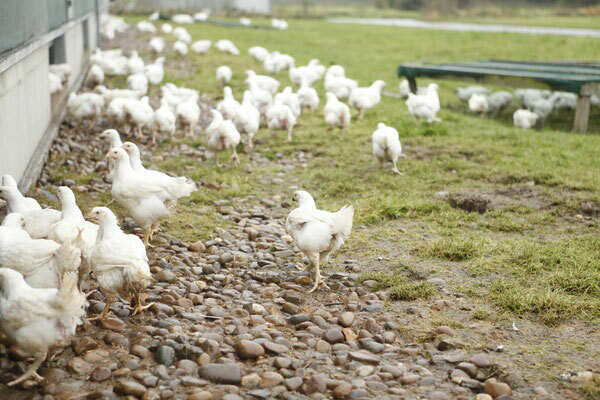 H&T Free Range chickens have access to outdoor ranges where they grow more healthily and are able to exhibit more natural behaviour, whilst being given a quality non-genetically modified feed. 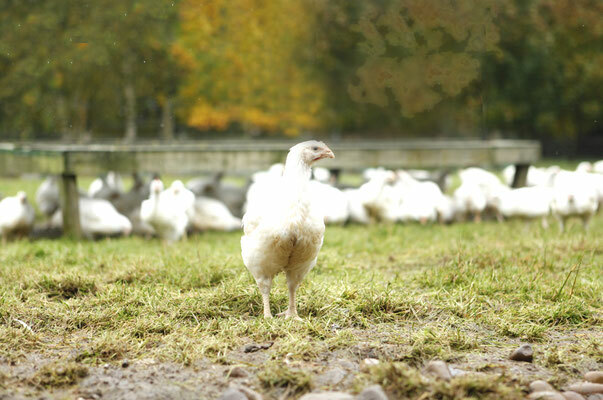 We work with accredited catchers and hauliers to move our birds to slaughter every week. H&T Chickens come trussed and tagged. Please ensure when buying. We have been trailing H&T Organically Reared chickens since July 2018 and now take these birds to slaughter on a weekly basis. H&T Organically Reared chickens are given an organic feed as opposed to the high quality non-GM feed given to our Free Range chickens. Organic birds must be farmed such that there is a plot rotation with every new batch of birds. They are not given any antibiotics nor any vaccines. Their grass ranges are not treated with any fertilisers or pesticides and certified to that affect. Unfortunately due to current legislation we are not allowed to term our chickens as organic, as they are halal slaughtered without being stunned. It is at that point they are no longer deemed organic, hence Organically Reared.